Welcome to Liverpool’s Metropolitan Cathedral. Savour the silence. Join us in prayer. Take a tour. 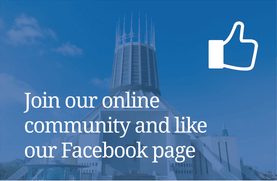 Whatever shape your visit takes, we’d love to welcome you to Liverpool’s Metropolitan Cathedral of Christ the King. Perched high above the city, our Cathedral offers a place to pause. A sacred place to stop, recharge your spirits and reawaken your senses. As Britain’s largest Catholic Cathedral we offer a huge welcome to friends from all faiths, all walks of life, all corners of the globe. Maybe you can time your visit to take part in a mass, witness one of our wonderful music concerts and special events or explore the magnificent Lutyens Crypt. Or perhaps you might want to take part in one of our Educational Programmes for schools. As the beating heart of our community, we have a year-round programme of warm and welcoming services which transform our Cathedral into the intimate, yet uplifting space it is – but you might prefer to simply sit, bathed in the filtered light that falls from the heavens, through the vivid glass of our spectacular lantern tower, which illuminates the circular sanctuary. A place of worship, a space of quiet awe. Climb up, out of the city, into a special space. As we said, in the name of Christ, you’ll be made most welcome.